Like many horse jewelry collectors, you may have a passion for horseshoe jewelry What is more emblematic of the horse than the horsehoe? Every horse jewelry collection contains at least a few horsehoe pieces. This Victorian 14k Rose Gold and Pearl Horseshoe Ring is a stunning example. This sensational piece has 11 round pearls, each with beautiful luster. The pearls are prong set into a horseshoe shape with an elaborate raised and cut-out side gallery. On either side of the horseshoe setting is an attractive etched design. 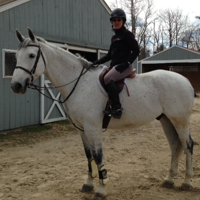 This is a special piece of antique equestrian jewelry. Not only does it combine the elegance of pearls with elaborate design work, it incorporates the classic horsehoe motif in a way any horse lover would consider themselves lucky to wear. Many stunning pieces of estate jewelry featuring horses also incorporate the horseshoe motif. The beauty of estate and antique jewelry, particularly horse jewelry, is how unique and well-crafted the pieces are. Consider this Antique Rose Gold Horseshoe Ring Like the previous piece, this lovely ring features the horseshoe motif and intricate detail work. In fact, the band of this ring is a riding crop! 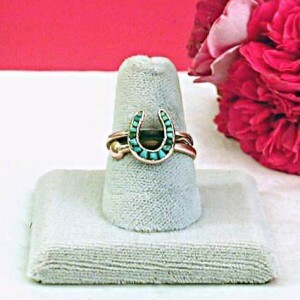 The ring also features 17 turquoise stones — making this ring irresistable to any true fan of turquoise jewelry. This is the real deal, too — not the cheap stuff you’ll find sold in tourist traps! Circa 1885, this gold ring has a fantastic rose gold patina that would look superb with any skin tone. Both rings are size 6.5, and both are surprisingly affordable. If you’re just starting to collect horse jewelry they’re great pieces to begin with. If you’ve been collecting for years, both pieces are strong enough and unique enough to enhance any collection. Don’t miss out on these special rings for horse lovers! 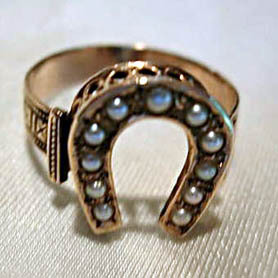 Out of curiosity, how much did the ring Victorian 14k Rose Gold and Pearl Horseshoe sell for on your site? I fell in love with it and just want to know. Many thanks!